British-based terrorists have carried out operations in Pakistan, Afghanistan, Kenya, Tanzania, Saudi Arabia, Iraq, Israel, Morocco, Russia, Spain, and America. Many governments - Jordanian, Egyptian, Moroccan, Spanish, French, and American - have protested London's refusal to shut down its Islamist terrorist infrastructure or extradite wanted operatives. In frustration, Egypt's president Hosni Mubarak publicly denounced Britain for "protecting killers." One American security group has called for Britain to be listed as a terrorism-sponsoring state. Counterterrorism specialists disdain the British. Roger Cressey calls London "easily the most important jihadist hub in Western Europe." Steven Simon dismisses the British capital as "the Star Wars bar scene" of Islamic radicals. More brutally, an intelligence official said of last week's attacks: "The terrorists have come home. It is payback time for … an irresponsible policy." More broadly, President Chirac instructed French intelligence agencies just days after September 11, 2001, to share terrorism data with their American counterparts "as if they were your own service." The cooperation is working: A former acting CIA director, John E. McLaughlin, called the bilateral intelligence tie "one of the best in the world." The British may have a "special relationship" with Washington on Iraq, but the French have one with it in the war on terror. France accords terrorist suspects fewer rights than any other Western state, permitting interrogation without a lawyer, lengthy pre-trial incarcerations, and evidence acquired under dubious circumstances. Were he a terrorism suspect, the author of Al-Qaida's Jihad in Europe, Evan Kohlmann, says he "would least like to be held under" the French system. The dispute ended up in litigation and the Court of Appeal ultimately decided in Ms. Begum's favor. As a result, by law British schools must now accept the jilbab. Not only that, but Prime Minister Blair's wife, Cherie Booth, was Ms. Begum's lawyer at the appellate level. Ms. Booth called the ruling "a victory for all Muslims who wish to preserve their identity and values despite prejudice and bigotry." By contrast, also in 2004, the French government outlawed the hijab, the Muslim headscarf, from public educational institutions, disregarding ferocious opposition both within France and among Islamists worldwide. In Tehran, protesters shouted "Death to France!" and "Death to Chirac the Zionist!" The Palestinian Authority mufti, Ikrima Sa'id Sabri, declared, "French laws banning the hijab constitute a war against Islam as a religion." The Saudi grand mufti, Abdul Aziz al-Sheikh, called them a human rights infringement. When the "Islamic Army in Iraq" kidnapped two French journalists, it threatened their execution unless the hijab ban was revoked. Paris stood firm. Though Britain and France have faced a similar threat from Islamist terrorism in the years following September 11, 2001, they have often responded in different ways to the challenges it posed. This ground-breaking work offers the first in-depth comparative analysis of counter-terrorist policies and operations in these two leading liberal democracies. 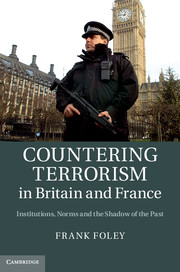 Challenging the widely held view that the nature of a state's counter-terrorist policies depends on the threat it is facing, Foley suggests that such an argument fails to explain why France has mounted more invasive police and intelligence operations against Islamist terrorism than Britain and created a more draconian anti-terrorist legal regime. Drawing on institutional and constructivist theories, he develops a novel theoretical framework that puts counterterrorism in its organisational, institutional and broader societal context. Related Topics: Counter-terrorism, Muslims in Europe, Muslims in the United States, Terrorism | Daniel Pipes receive the latest by email: subscribe to the free mef mailing list This text may be reposted or forwarded so long as it is presented as an integral whole with complete and accurate information provided about its author, date, place of publication, and original URL.